Whilst the cottage retains many character features, such as exposed A frame beams in bedrooms and ensuites; it has been internally modernised to a very high standard. On the ground floor there is a large open plan kitchen / dining area / lounge. For convenience there is a small powder room under the stairs. The kitchen is fully equipped and includes a full size electric hob, oven and extractor hood, full sized integrated dishwasher, microwave oven, toaster, kettle, large french door fridge with lower freezer and integrated washing machine. Dishwasher and washing materials supplied. In the lounge area there is a 40" flat screen TV with both UK Freeview and French channels. There is also a DVD and Blu-Ray player. A very comfortable leather suite with two sofas and one reclining lounger chair. Upstairs there are two large double bedrooms fitted out with luxury king sized beds. Crisp white cotton linens. Comfortable pillows and quilts. Each room has a very luxurious en suite with freestanding claw foot bath, fully tiled shower with glass door, wash basin and toilet. Illuminated mirrors with shaving sockets. There is a small lawned garden area to the front with a paved terrace and parking for two cars. Table and chairs for dining outside and of course a BBQ. Sunbeds for a lazy sunny day are available. The terrace benefits from sunshine all day and into the evening. The property has gas central heating, instant hot water and a gas woodburner effect stove for cosy nights in. There is also a safe for your security. There is free wifi in the cottage. We are approx. 75 minutes from Caen ferry terminal and Rennes airport. A generous welcome basket / fridge essentials awaits to get you started. Kim and Phil are the owners at Maison Poppie having purchased the gite and its neighbouring owner’s accommodation in February 2018. Having spent two years searching for the perfect spot for their re-location to rural France Kim and Phil are confident that the area has much to offer visitors with a wide range of interests. The couple have holidayed in Normandy and Brittany for over twenty years. Maison Poppie offers a peaceful hamlet setting whilst still being accessible for local shopping and tourist destinations, just the kind of place they would have searched for themselves for a relaxing break. Whilst the very high finish of the gite itself provides everything for the discerning guest. Maison Poppie is located in a small hamlet within the Parc Naturel in the region of Basse-Normandie. Whilst we love the peace and quiet of this area it is ideally situated for exploring the delights of Normandy. Amongst the huge variety of activities and places to visit are daily street markets, medieval towns, chateau’s, churches, abbey’s, castles, walking trails, fishing, horse riding, golf, go karting, calvados distillery....... Mont St Michel is the second most visited landmark in France (1 hour drive). Villedieu-Les-Poeles is the 12th century birthplace of copper (40 minutes). The Pottery Museum at Le Fresne Poret is a 2 minute drive. Medieval Bayeux is home to the world famous tapestry (75 mins). Many WW2 sites and museums including the landing beaches are nearby Bagnoles-de-l'Orne is a beautiful place to visit with parks, shops, golf and many places to eat (40 minutes). Granville (1 hour) has sailing, diving, sea kayaking, land yachting and canoeing. There is also a superb links golf course. Medieval Domfront is a town with half timbered houses and castle (20 minutes). About 1 hour away is the ancient town of Fougeres with a castle and gardens. Lonley l'Abbaye famous for a Abbey and biscuit works is a pretty village (15 mins) Mortain is 10 minutes away and was the site of a huge WW2 battle that helped swing the war in the Allies favour. It also has the ‘Grand Cascade’ waterfall where you can walk and climb, L’Abbaye Blanche (ancient Cistercian Abbey), and Petit Chappelle where, on a clear day, you can see Mont St. Michel. There is also an outside heated swimming pool and Go Kart track. Just outside Ger is Fosse Arthour - allegedly the resting place of King Arthur – with lovely country walks (15minutes). You can walk for miles in the area along old railways lines or along the chemins (bridleways). Walkers will find numerous trails around Barenton, Ger, Mortain, Sourdeval and St-Hilaire-du-Harcouet. 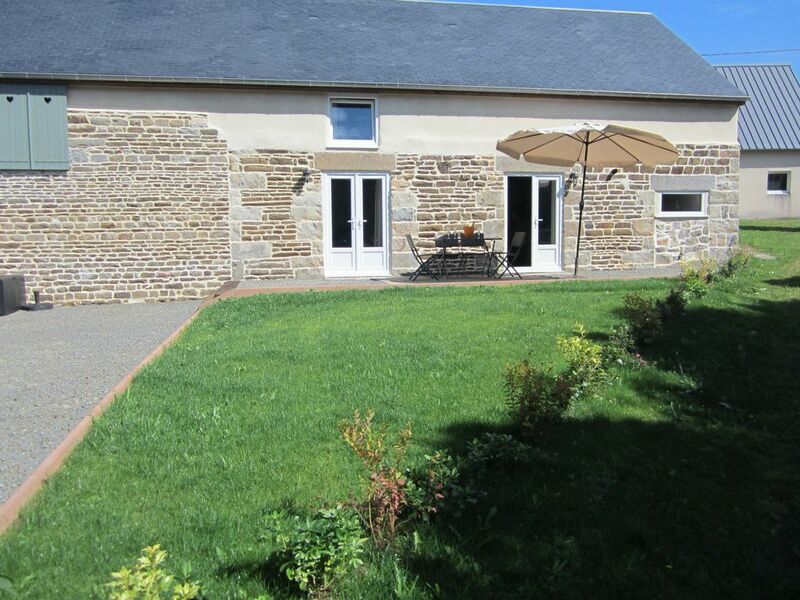 The detached barn conversion has been completed to a very high standard and is situated next to the owners home but totally detached, private and independent Incorporated into the recent refurbishment are all the things that we wanted when holidaying in France. Offering a little more luxury than the normal gite experience. Ferries and flights are always changing but a quick search on the internet will give you the latest information. Brittany Ferries to: Caen – 90 km from us, St. Malo – 105 km, Cherbourg – 140 km, Le Havre – 175 km. TRAIN - Eurostar to Calais – 420 km from us. FLIGHTS - Ryanair to Dinard (near St Malo), FlyBe to Rennes – both 110 km from us. So glad you all enjoyed your stay at Maison Poppie. Many thanks for your kind comments. Maison Poppie is really well presented in a lovely quiet location. Downstairs has plenty of room, a comfortable living area and the bedrooms are spacious too, the standard is excellent. We were greeted by Kim and Phil who are so friendly and helpful, and also provided us with some much appreciated culinary treats on arrival. The setting is just great, very nice area in front of the house to sit out in the sun and perhaps a wave from the also friendly neighbours! It’s an easy drive to the supermarket or cafe, restaurant, some lovely places around to visit for a day out. All in all we loved it and would definitely revisit. We are so very pleased that you all enjoyed your stay at Maison Poppie. Thank you for your kind words, please do come back for another visit at any time. Also many thanks for leaving Maison Poppie in such good order at the end of your stay, much appreciated. Although Maison Poppie looked good on the website, when we arrived we found it exceeded all expectations! All we had hoped for - crisp and fresh linen, sumptuous beds, luxury ensuites and thick towels, well-appointed contemporary kitchen, everything finished to a high standard, and everything worked. Kim and Phil were such kind and welcoming hosts, responding to our booking so quickly, discretely next door, but always available if we needed help. The little extra touches were much appreciated since we arrived on a national holiday! Outside - birdsong (including the turkey! ), the occasional car and tractor, lovely rural walks, but not too far to go to find shops, interesting places to visit and eat. Definitely a place we would happily revisit. Thank you so much for review. It was lovely to meet all of you and we are so glad you enjoyed your stay at Maison Poppie. We would be very happy to welcome you again any time. Fijne accommodatie om te verblijven, alles aanwezig van wasmachine tot twee luxe slaapkamers met dito badkamer. Mont Saint Michel op een uurtje rijden. Rustig gelegen, Engelse eigenaars vriendelijk en behulpzaam. Gastvrij onthaald met een mandje met lekkernijen. Bedankt voor je vriendelijke beoordeling van Maison Poppie. We zijn zo blij dat je van je verblijf hebt genoten en veel interessante dingen hebt kunnen doen. Hartelijk dank voor het verlaten van de gite aan het einde van uw verblijf in zo'n goede staat. Maison Poppie is gelegen op een mooie rustige locatie. Bij aankomst werden we vriendelijk begroet door Kim en werden we getrakteerd op een aantal culinaire dingen. De benedenverdieping is heel ruim met een grote comfortabele woonkamer en heeft een mooie keuken met alles erop en eraan. Ook de slaapkamers zijn ruim en mooi en ideaal met zijn eigen badkamers. Zoals gezegd ligt het huis in een zeer mooie landelijke omgeving en het heeft een fraai en zonnig terras aan de voorzijde van het huis. De weg naar de supermarkt in Mortain was ook goed te vinden. Al met al is dit een fijne locatie om van hieruit uitstapjes te plannen naar Mont St. Michel, Invasiestranden, zwembad in Vire en natuurlijke de andere leuke plaatsen in Normandië. Helaas hebben we onze vakantie eerder moeten afbreken, maar het is ons zo goed bevallen dat we zeker nog een keer terug willen gaan. We are so glad that you enjoyed your holiday at Maison Poppie but very sorry that your stay was cut short in such sad circumstances. Please come again at any time. We very much appreciated the fact that you left the gite in such good order despite having to return home in a hurry.